Manchester Masterclass: Cristina González (Oklahoma State University) – Thursday 22nd March 2018, from 10-12 midday. If you would like to attend the masterclass, please e-mail Dr Cordelia Warr, Art History and Visual Studies (cordelia.warr@manchester.ac.uk). The class probes the circulation of people, ideas and objects in the early modern Spanish world. While focusing on circuits of exchange, discussion will move beyond “origins” and a model-copy dichotomy in order to investigate refractive networks that emphasize materiality, context, and performance as sources for new meanings within the Spanish viceroyalties. Cases in which images gain currency through repetition, adaptation, and travel are especially relevant. We also explore the transformative potential of exotic materials, particularly with regards to devotional objects. How do early modern encounters impact the sacred in its material forms? Porras, Stephanie, “Going viral? : Maerten de Vos’s St. Michael the Archangel,” Netherlands Yearbook for History and Art 66:1 (2017), 54-79. González, Cristina Cruz., “Our Lady of El Pueblito: A Marian Devotion on the Northern Frontier,” Catholic Southwest: A Journal of History and Culture 23 (2012), 3-21. Art history has approached female monastic culture in New Spain through the lens of crowned-nun portraiture, a late colonial genre that reaffirmed a nun’s position as a mystical Bride of Christ. This has led to scholarly neglect of female imitatio Christi and the ecclesiastical pretence exhibited by several early modern holy women in Spain and Spanish America. Using examples from Spain, Mexico, and Guatemala, this talk explores the various pictorial strategies for capturing and performing an alter Christus status in transatlantic female communities. I discuss the images from the standpoint of their theological and political relevance while considering their optical demands and how they enlighten our understanding of a mimesis-imitatio correlation. 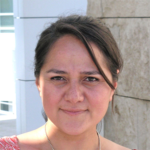 Cristina Cruz González is a specialist in the visual culture of Spanish America. She received her Ph.D. in Art History from the University of Chicago and her M.Phil in Classics from Cambridge University. She holds an M.A. in Art History from the University of Texas at Austin and a B.A. in Anthropology from Yale University.